Kids Zone Birthday Parties | RuckerFamilyAmusement.com Athens GA.
Now Open!! Kids Zone of America at the Georgia Square Mall right next to JC Penny. A great way to play indoors and have some fun. Need some alone time to shop? Drop you child off where they can have loads of fun while you enjoy shopping! Do you need to have date night? Enjoy yourself every Thursday from 5pm to 9pm for Date Night Thursdays by leaving your kids with us for movie night and so much more fun. Also need to book a party and have not yet decided where? Book today for only $10.00 a child. Exciting new Inflatables, Games, Movies, Arts & Crafts with painting, slime making, coloring and so much more! Have some shopping to do? Leave them with us for only $10.00 per hour. wristbands for the day with a private party room for one hour. Please reserve by signing up for date night for $25.00 which would include snacks, movies, updated text with photos and some alone time for you from 5pm to 9pm. 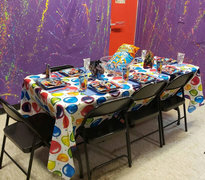 Our fun birthday party room is available for your family parties for $10 for two hours and an additional $10 per child. There is a $50 deposit required, with a minimum of 5 children. The maximum number for kids is 32 kids. Please Note: that anyone under 59 inchess must have a wristband upon entrance.